We haven’t been open that long, but to our guests who have already visited: THANK YOU! THANK YOU! THANK YOU! Our diners have spoken and we have already catapulted to the top tier of Open Table’s Diner’s Choice Awards! We are now featured as Pittsburgh Winners for “Best Ambience”, “Contemporary American”, “Romantic” and “Special Occassion”! Your unbelievable support has inspired us, and we strive to become better each day. Our sincerest gratitude. Click here, to make your next reservation! Everyone keeps asking, “Are you open?”, and we can now say with resounding confidence, “Yes! Altius on Mt. Washington is open!” We still need to put a few finishing touches on the outside, but we would love to welcome you! 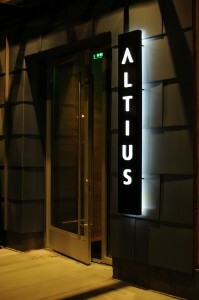 Altius is going to become one of the hardest reservations to book in Pittsburgh. I think the only reason I was able to get in was because people didn’t know it was open yet…While most restaurants on Mt. Washington seem to rely on their view and don’t put much effort into innovation of their food, Altius combines a stunning view with a unique, high quality menu…. The ambiance of this restaurant is a step above anything else in Pittsburgh, it has a chic modern feel. The food was excellent, the presentation showed an attention to detail and the sauces superb! We stopped in on a whim and I’m so very glad that we did. The decor, view, and FOOD were amazing. We will absolutely be returning! Two years ago B and I met the Mazzarini family and began our journey. After years of passion and planning, the result, Altius, is finally nearing completion. A second restaurant has always been a twinkle in my eye. Being at the helm of Bistro 19 for the past seven and a half years has been rewarding, but as a chef, I’m always looking for opportunities to grow. Altius has given me the chance to step into a new space. Growing up in Michigan, away from my hometown of Pittsburgh, has always made me appreciate the view from Mt. Washington; with the opening of Altius, I get to experience this view each day. It has also given me the chance to learn new things. I have been able to try cutting edge techniques with the best quality food this area has to offer. I am so thankful to our many supporters, friends and family that have all been a part of this process. Their unwavering confidence in us has made our vision a reality. Along the way herpes symptoms in women I have developed relationships with our managers, chefs, local store owners and farms. I can’t wait to introduce these people and experiences to you in my blogs and in my menus. Love people, cook them great food! Copyright © 2019 Altius. All Rights Reserved.